Replacing the tub is a great way to improve the look and feel of your bathroom. Swapping one thing out for another seems like a simple enough home improvement project, but it may not be one you want to attempt on your own. While you might save a few bucks by trying to complete this project yourself, this is a job where it’s probably best to call in the pros. If you decide to do this project on your own, it’s important that you fully research and understand the scope of the project. Replacing a bathtub is a very time consuming and multifaceted process. Make sure you are willing to devote the time and effort to complete the job correctly. In most cases, it’s not as simple as a direct swap. 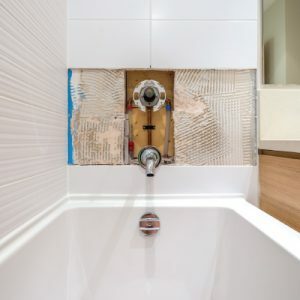 It’s unlikely that the new tub will be the exact same size as the old tub, so tiles, flooring, molding, plumbing, and other parts of the bathroom may need to be removed and/or replaced. This becomes even more involved if you are moving the tub to a new location in the bathroom with the new install. You also need to consider if a permit is required for your project; if you are changing the location of the tub and therefore redirecting plumbing, you may need to get a permit. If you don’t complete the project correctly, you could run into safety on top of monetary issues. Incorrect installation could lead to: leaks, water damage, structural damage, and cosmetic damage. Not only are these costly to fix, some of them could also be dangerous. In extreme cases, your newly installed tub could even fall through the floor. Replacing a bathtub can be an expensive project, with total prices ranging from $1,000 to $4,000. At that price tag, this is something you want to make sure you have done correctly the first time. Unless you have a contracting or plumbing background, you run the risk of completing part of the project incorrectly, causing it to cost even more money in the long run. By hiring a plumber, you can ensure that the project is done correctly and safely. A larger price tag up front could save you a lot of money down the road. In addition to doing the job correctly, a plumber can also check for leaks, mold, and other issues that you may not notice if you attempt to do the project on your own. Hiring a professional can also ensure that your warranty on your tub will be honored should something happen in the future. A professional can also make sure the floor can support the weight of the tub, and can properly reframe the tub if needed. With all of the costs and risks considered, it is worth the peace of mind to leave it to the pros for your new bathtub installation.